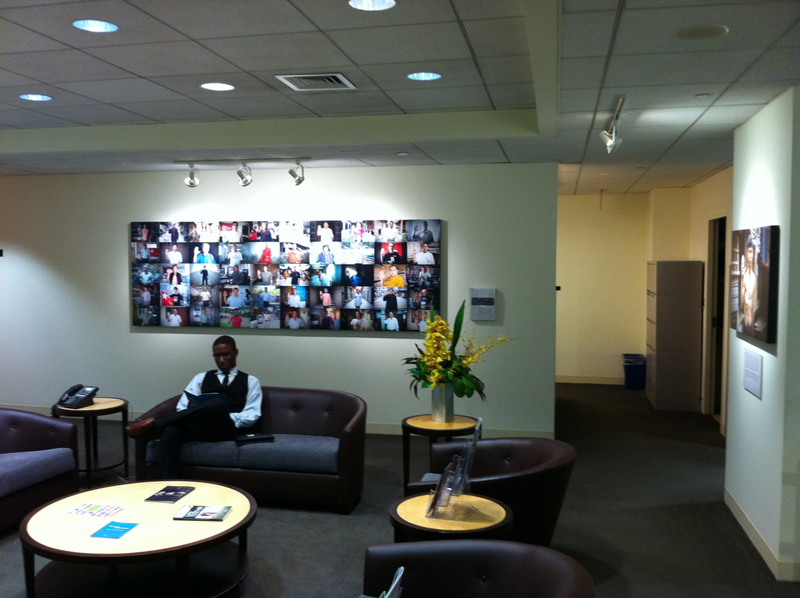 A great week back in the big apple and saw the Moving Walls 19 opening reception being held in great style at the Open Society Foundations headquarters in New York City. 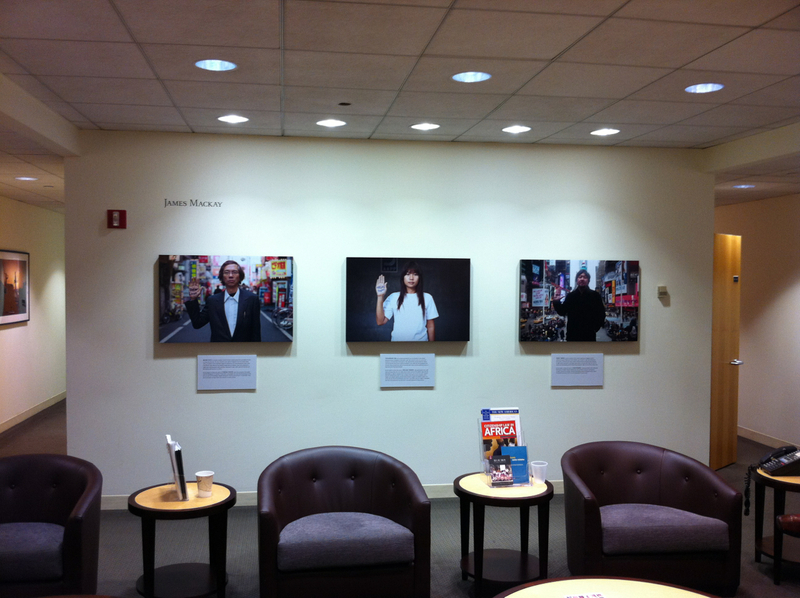 The work ha sheen well received and looks great on the walls at OSF and its great to be partnered with them now to promote this issue even further. Below is a short clip of the opening night and some images of the installation. 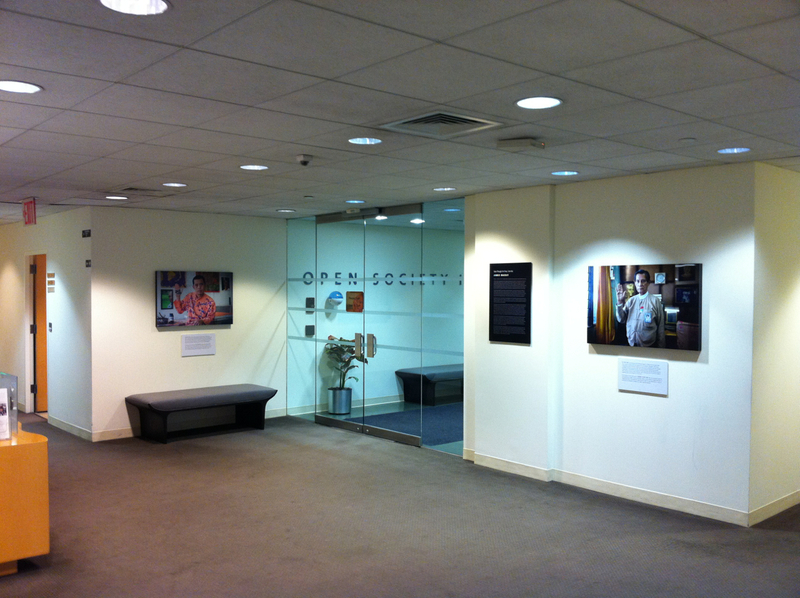 Thanks to all at OSF in the Documentary Photography Project and the Burma Project – here’s to the future. 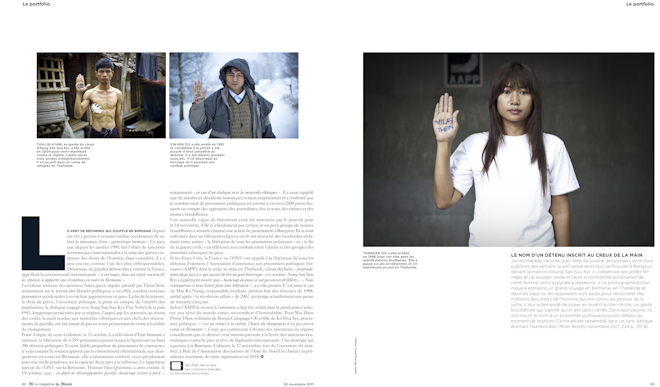 A first for France as this saturday’s ‘Le Portfolio’ section in ‘Le Magazine du Monde’ features an 8 page article previewing the book and the issue of Burma’s political prisoners. With the exhibition and book launch tomorrow evening (Thursday 24th) at the Serindia Gallery, the Bangkok Post ‘Life’ section features a cover feature of ‘Abhaya’ plus an interview with gallery owner Shane Suvikapakornul. With no end in sight to the recent horrific flooding in Thailand, and in particular for me in Bangkok, the book seemed destined to be delayed by the deluge of water that seemed never ending. But somehow the first batch managed to make it out in between low and high tide and arrived just in time for me to despatch the first few copies before heading over another large expanse of water to the USA. Signing my first book was a novel experience and provided much entertainment, but was a great pleasure and honour to do so for a good friend and someone who works so hard for Prisoners of Conscience in Burma and around the world. The Prisoners of Conscience Appeal Fund provides grants for relief and rehabilitation to people who have been persecuted, imprisoned and tortured for their conscientiously-held beliefs. The assistance they provide is vital and the small team who work there lead by Lynn Carter work valiantly for political prisoners, human rights defenders, lawyers, environmental activists, teachers and academics who come from many different countries such as Burma, Zimbabwe, Sri Lanka, Tibet, Iran, Cameroon and Eritrea. After a nice cup of afternoon tea (when in Rome as they say…) there was just about time to deliver the final copy to my friends at Bayeux in London’s Soho,who have provided so much help and support over the years and are mighty fine printers to boot. So a huge thanks must go to Terry, Rick, Julie, Iris and all the team – not just for printing the recent 5ft prints that are on their way to New York for the OSI Moving Walls exhibition opening on the 30th, but for featuring the work in the windows and on display inside the reception area – cheers guys for all the hard work and support over the years. A Bayeux Tapestry to be proud of. Even Rhianna can’t keep her eyes off it. CNN anchor, Kristie Lu Stout, presents a slideshow of ‘Abhaya – Burma’s Fearlessness’ on the primetime daily show, News Stream, on the day that 227 political prisoners were released from jail in Burma. Topping the headline news makes a welcome change for Burma and one we could relish as well with our work on display to millions across the world enjoying their breakfast in America, afternoon tea in the UK or evening noodles in Asia. The early morning call from Hong Kong lead to a crazy day dashing across London as slowly, one by one, political prisoners were being released. Being stuck in Europe on this of all days was not ideal considering the time difference and logistical difficulties trying to get updates using Skype and G-talk whilst constantly on the move, but luckily I managed to find a quiet room at Getty Images to do the voice over that took more attempts at trying to get a clear line than it does when trying to call into Burma. 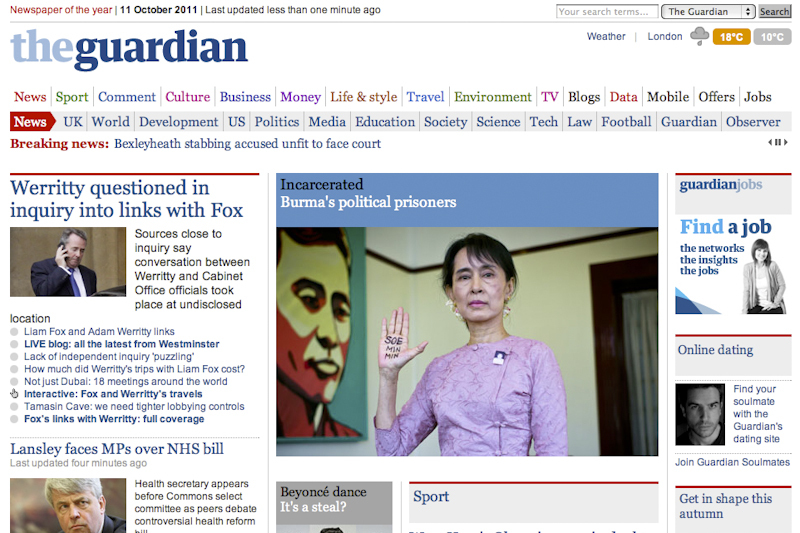 A moment in the spotlight for this work and Burma, despite the end result seeing fewer released than expected. Hopefully there is more to come as the countdown to the book being launched in Rangoon in mid-November draws ever closer. 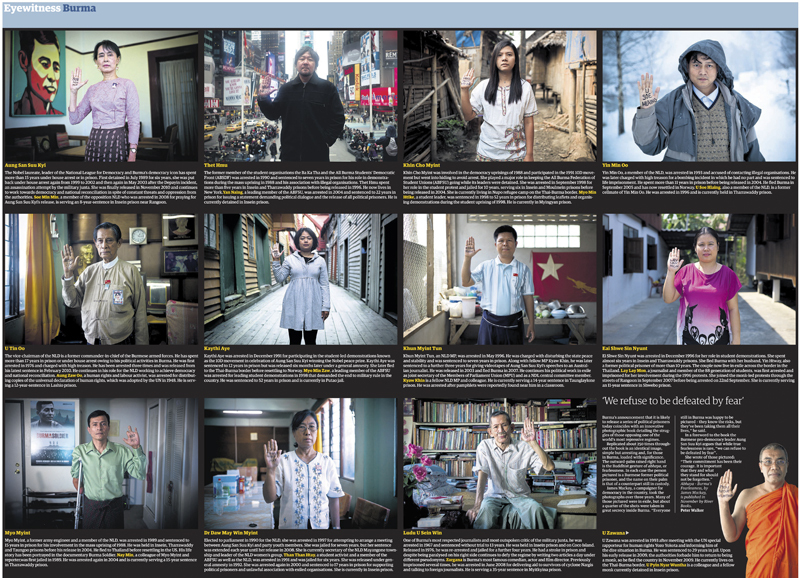 On the day the Burmese regime finally announce the long expected prisoner amnesty, the Guardian newspaper pull out all the stops and go big for a double page centre spread on the former political prisoners from this project that is now better known as the book ‘Abhaya – Burma’s Fearlessness’. There is also a beautiful online slideshow gallery that can be viewed on the Guardian website with a premiere showing of the Lady’s portrait and others from inside Burma including U Tin Oo and Dr Daw May Win Myint. Today is also the day that the book gets launched at the Frankfurt book-fair. It’s been a busy day all round but nothing has been achieved yet. Here’s hoping that later on today there will be good news and we can finally start celebrating the release of political prisoners… and everything else as well. 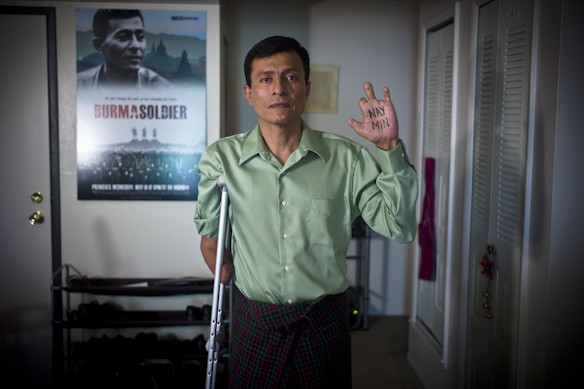 After 3 long years of hard work and over 100,000 miles travelled, finally the book of our long term project documenting Burma’s political prisoners will be published in November 2011 by River Books. Hopefully all political prisoners will also be released by then as well. 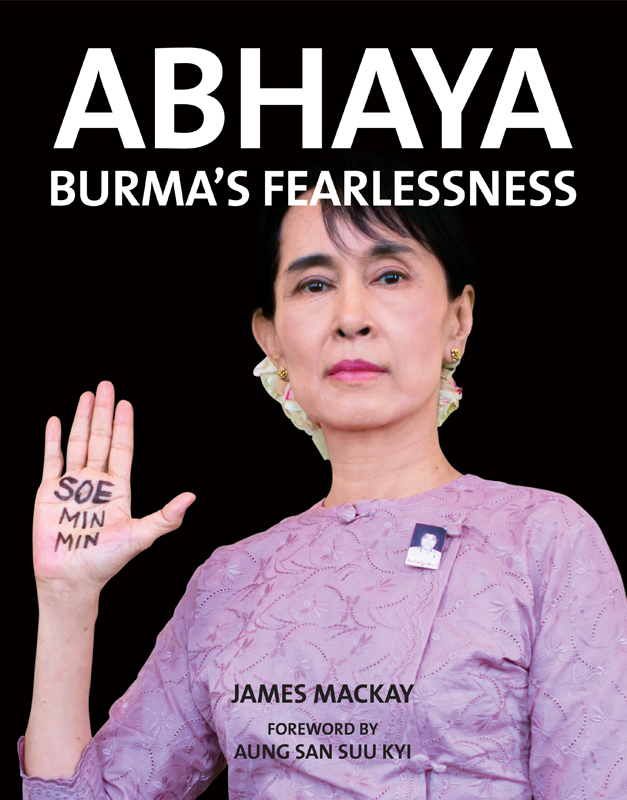 Featuring a foreword written by Aung San Suu Kyi and portraits of more than 250 former political prisoners in exile around the world (as well as over 50 from inside Burma, including leaders of the National League for Democracy), ‘Abhaya – Burma’s Fearlessness’ captures a moment in time in Burma’s history, dated October 2011, with more than 2,000 political prisoners incarcerated. The Abhaya mudrā (“mudrā of fear-not”) represents protection, peace and the dispelling of fear. In 1962 a military coup lead by General Ne Win saw Burma, an isolated Buddhist country in South-East Asia, come under the power of one of the world’s most brutal regimes. For the past five decades, thousands of people have been arrested, tortured and given long prison sentences for openly expressing their beliefs and for daring to defy dictators who tolerate no form of dissent or opposition to their rule. Today, more than 2,000 political prisoners including monks, students, journalists, lawyers, elected Members of Parliament and over 300 members of Aung San Suu Kyi’s opposition party, The National League for Democracy, are incarcerated in Burma’s notorious prisons. 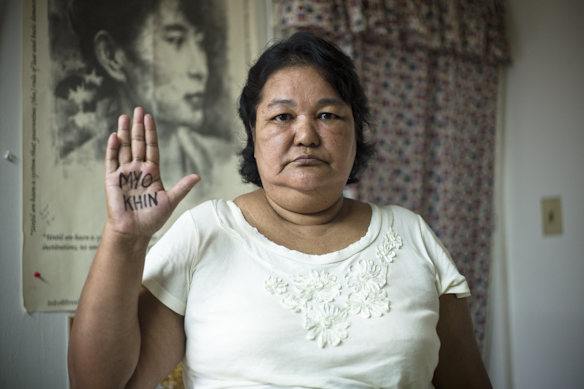 In Burma and across the world, almost 300 hundred former political prisoners have come together to raise awareness of the tragic plight of their colleagues still detained in jail. 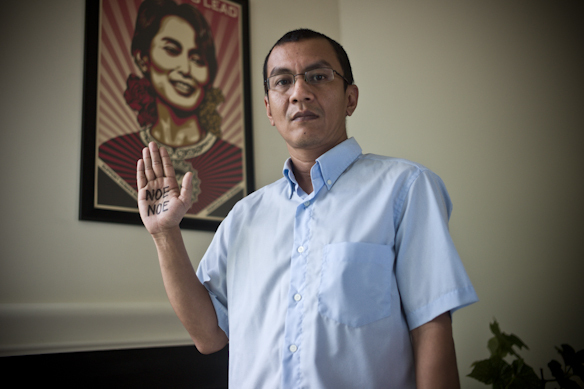 Photographed standing with their right hand raised, palm out-turned facing the camera, the name of a current political prisoner is shown written on their hand. The sacred Buddhist gesture of Abhaya, “Fear Not”, is not only an act of silent protest, but also one of remembrance and fearlessness. The Open Society Institute has selected my long term project for Burma’s political prisoners ‘Even Though I’m Free I Am Not‘ to be part of the prestigious Moving Walls exhibition programme. The exhibition opens in New York with a reception on November 30th and lasts for 9 months before moving to Washington DC for a further 9 months. With 400 applications submitted, being selected as one of seven photographers to be part of this programme is humbling to say the least. 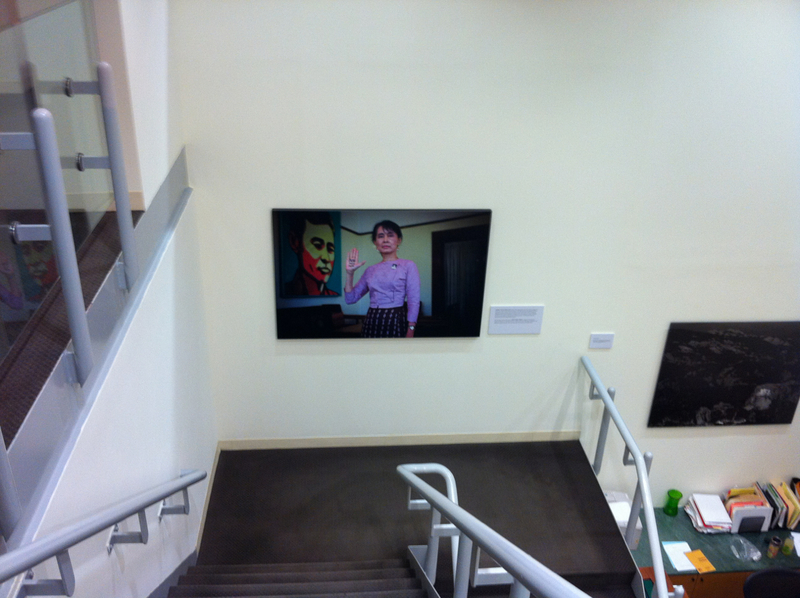 Also with my work being shown in the main reception area, it’s a massive honour for me and for everyone involved in this work over the past 3 years and is of course very exciting, but most importantly it gives the issue of Burma’s political prisoners another platform and hopefully valuable exposure – there will be an exclusive first showing of a number of former political prisoners from inside Burma who we have been waiting for the right time to show to the world. This is that time. Visiting USA seems to come as a last minute, unexpected but great surprise. In January we were on a plane with 48 hours of getting the call from Yoko Ono and this time is almost the same as frantic calls between Indiana, New York and DC confirm that it’s now or never. So now it is and a four day four city tour begins in DC currently in full meltdown with a record 100 degree heatwave hitting the city as I land. Beats the 18 percent grey of the UK. It’s 20 years since I was last in DC, back then it was just passing through, catching a few sites and this time is not much different with just 24 hours to take in RFA, VOA and other killers in the airwaves. First stop was RFA and finally a chance to meet everyone after years of relying on that old communication device, the telephone. 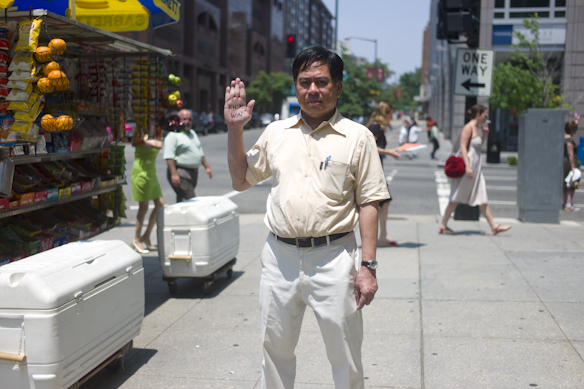 Thanks to Nyan Winn Aung for helping to arrange this as back into the streets we went to photograph, Nay Rein Kyaw, Soe Win and Nay Lin. Racing across town, next stop was VOA and a building the size of Buckingham Palace overlooking the National Mall. Catching up with Thar Nyunt Oo who I had met last year in Bangkok amidst the chaos of the Red shirt uprising it was another great opportunity to meet the other half of Washington’s exiled Burmese ‘Saboteurs’ as the regime would like us all to believe they are. Kyaw Thein had helped me set up this opportunity but as before at RFA the first spanner in the works appeared in taking people’s portraits. The role of journalists is to be objective and report truthfully and in the case of all at RFA, VOA and other Burmese exiled media this is in no doubt even if it may appear that they are all activists fighting the regime – it’s not their fault that there is only a bad picture that can be painted about the Burmese government. But unfortunately hand in hand with that impartial role as a journalist taking part in this work appeared to be crossing the line. For me, whilst disappointing, I can understand and respect this decision of the powers that be high up, but for everyone in the Burmese section and particularly the former political prisoners who could now not join their colleagues I felt a sense of sadness. 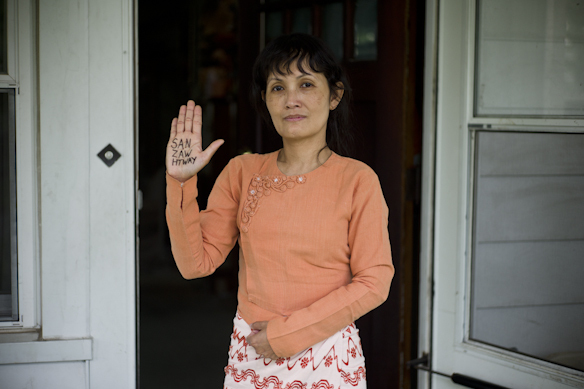 It was always going to be impossible to photograph every former political prisoner in the world and there are of course many who have been photographed in Burma who I cannot show, but now those who are allowed to be photographed will also represent those who are not. With DC wrapped and a quick stop off in between flights to meet Nyi Nyi Aung and Aung Din, the next stop on this flying visit was Fort Wayne, Indiana and the home of more than 7,000 refugees from Burma who have been resettled in this industrial town in Midwestern USA. It is home to a significant number of former political prisoners too and with the help of good friends Aung Khaing Min from AAPP who was in town at the time and Myo Myint, who many of you will know from Nic Dunlop’s stunning film ‘Burma Soldier‘, a non-stop day criss-crossing from one end of town to the other saw another 11 portraits taken. A very special thanks to Karen for driving what must have felt like a thousand miles. Ending this project here in Fort Wayne is fitting. This is no bright lights big city environment of London, Tokyo or New York. It is a place that is real and perhaps with it brings many of the realities of real life. If the struggle for democracy has been a long and difficult one, then the struggle to rebuild your life is as hard. Being here now to end this long journey that has been full of emotional pain and joy in equal measures, it is a perfect place to reflect on what those less fortunate than many of us in this world have to go through. Returning to America in such haste and so soon after only having been here a few months ago was because of what is to come in the second half of this year. When this whole project first started I could never have imagined I would be where I am now having put together more than 250 portraits, testimonies and personal stories providing a small insight into the horrendous past, present and likely future of Burma’s political prisoners. It was my desire from the start that at some point I could somehow be able to put it altogether into a book that might be able to capture a moment in time of part of Burma’s long struggle and also perhaps help people understand more about the deplorable suffering endured by the Burmese people. Now the final chapter can start. The book has been confirmed and the long process of editing is underway. I hope that the end product will do justice to all of those who’s company I have enjoyed and who’s lives I have been honoured to portray over these past years. The final curtain falls as a new dawn breaks.